Deep-dish pizza crust includes a fair amount of fat. Some recipes rely on oil, but we thought the rich flavor of butter was unbeatable in this crust. We found cornmeal in just about every ingredient list we reviewed, and it indeed added good earthy flavor and crunch. To achieve maximum flakiness, after mixing the dough and letting it rise, we employed a technique called laminating, which involves layering butter and dough through a sequence of rolling and folding to create ultra-flaky pastries. Adding melted butter to the pizza dough and spreading the rolled-out dough with softened butter before folding did the trick in our crust. Moving the dough into the refrigerator for its second rise ensured that the butter remained in distinct layers and didn’t get too soft. For the finishing touch on our crust, we oiled our cake pans, which made the crust crisp and even more flavorful. 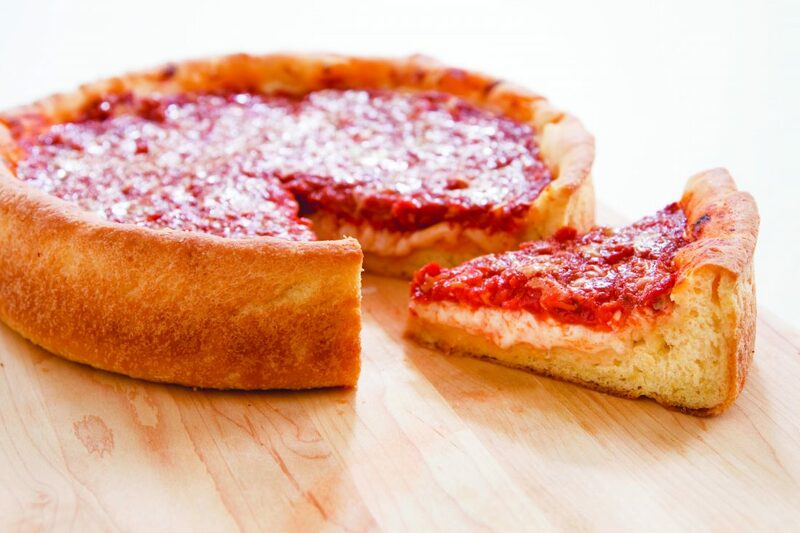 Following Chicago tradition, we covered the dough with shredded mozzarella before topping it with a thick tomato sauce. The cheese formed a barrier between the crust and the sauce, which prevented sogginess. A sprinkle of nutty Parmesan over the sauce provided a second layer of cheesy bite. We do not recommend mixing this dough by hand. Use the large holes of a box grater to grate the onion. For the dough: Whisk flour, cornmeal, yeast, and salt together in bowl of stand mixer. Whisk water, melted butter, and sugar in 4-cup liquid measuring cup until sugar has dissolved. Using dough hook on low speed, slowly add water mixture to flour mixture and mix until cohesive dough starts to form and no dry flour remains, about 2 minutes, scraping down bowl as needed. Increase speed to medium-low and knead until dough is smooth and elastic and clears sides of bowl, about 8 minutes. For the sauce and toppings: Heat 2 tablespoons oil in medium saucepan over medium heat until shimmering. Add onion, oregano, and 1/2 teaspoon salt and cook until onion is softened and lightly browned, 5 to 7 minutes. Stir in garlic and cook until fragrant, about 30 seconds. Stir in tomatoes and sugar, bring to simmer, and cook until sauce measures 2 1/2 cups, 25 to 30 minutes. Off heat, stir in basil and remaining oil. Season with salt and pepper to taste. Transfer to bowl and let cool completely before using. Adjust oven rack to lowest position and heat oven to 425 F. Press down on dough to deflate and transfer to clean counter. Press and roll dough into 15 by 12-inch rectangle, with short side parallel to counter edge. Spread softened butter over dough, leaving 1/2-inch border along edges. Roll dough away from you into firm cylinder, keeping roll taut by tucking it under itself as you go. With seam side down, flatten cylinder into 18 by 4-inch rectangle. Cut rectangle in half crosswise. Working with 1 half at a time, fold dough into thirds like business letter, then pinch seams together to form rough ball. Return dough balls seam side down to greased bowl, cover tightly with plastic, and let rise in refrigerator until nearly doubled in size, 30 minutes to 1 hour. Coat two 9-inch round cake pans with 2 tablespoons oil each. Press and roll 1 dough ball into 13-inch round of even thickness, sprinkling dough and counter with flour as needed to prevent sticking. Loosely roll dough around rolling pin and gently unroll it into prepared pan. Gently press dough into pan, working it into corners and 1 inch up sides. (If dough resists stretching, let it relax for 5 to 10 minutes before trying to stretch it again.) Repeat with remaining dough ball. For each pizza, sprinkle 2 cups mozzarella evenly over surface of dough, spread 1 1/4 cups tomato sauce over cheese, and sprinkle 2 tablespoons Parmesan over sauce. Bake pizzas until crusts are golden brown, 20 to 30 minutes. Let pizzas cool in pans for 10 minutes, then transfer to cutting board with metal spatula. Slice and serve. Nutrition information per serving: 622 calories; 316 calories from fat; 35 g fat (16 g saturated; 0 g trans fats); 59 mg cholesterol; 1162 mg sodium; 58 g carbohydrate; 4 g fiber; 6 g sugar; 25 g protein.